All is now set for the release of Weird MC's third album - New Dawn. 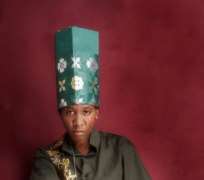 Her first album 'Simply Weird' was Nigeria's first full-length rap album, and she didn't fall below standard with her sophomore album 'After Da Storm'. Now more than a decade after she first hit the limlight, Adeshola Idowu, whom we have all come to refer to as Weird MC, is about to make another statement. With new videos, a fresh set of songs, a new management team, and contagious excitement, the rappatainer has shown to us that she means business. 'I'm not tired of doing good music, I have been doing music for more than a decade now, and I already understand the dos and don'ts of the industry. So, I'm too sure that the album won't be below standard' the energetic performer disclosed. 'Riranwo', the first single off her third album was released on July 9, 2007 as a forerunner for the album. But for more than a year, Weird MC has been so quiet about the release of her album until October 2008 when she played a fast one on us with the release of the video for Riranwo. The second video of the album 'Step Up' was released last week and Weird MC is ready for a new dawn 'The video was directed by DJ Tee, and we have really taken our time because I usually don't like taking fans for granted. And from what we see now, I know I am good to go', she said on a final note. The video for 'Step up' was conceptualized by Weird MC and was shot on 35mm for two days in South Africa. The video will rock the airwaves for weeks before the release of the album in March 2009 on her record label- 0907 Entertainment.